Jay Weinberg is walking on air. Given that he spent most of 2009 playing with Bruce Springsteen And The E Street Band, this is understandable. But just 24 hours earlier, the 19-year-old drummer finally jammed with another rock icon: his father, the Mighty Max. 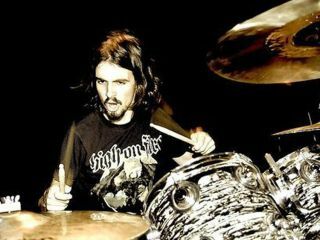 "I know it sounds incredible, but we never really played together," says Jay, who is in Los Angeles, along with a host of drumming legends (Tommy Lee, Chad Smith, Matt Sorum, Taylor Hawkins, Jason Bonham, Tool's Danny Carey, among others) for Guitar Center's Drum-Off Finals. Before five unknown sticksmen compete for the ultimate prize of 'Guitar Center Drum-Off Champion 2009,' there will be an all-star performance at the Wiltern Theatre called Bezerk, and during a rehearsal Jay and his illustrious dad indulged in some serious bonding. "It was the only time we ever sat down at two drum sets, side by side, and played together," marvels Jay. " It was wild! So many emotions ran through my head as we were playing: 'Wow, what a killer drummer he is.' 'Geez, that little fill he did, I never would've thought of that.' My dad's amazing. Beyond anything else that happens with the Drum-Offs, I'm so grateful for the experience of playing next to him." Although Jay admits to being "slightly intimidated" around the array of notables taking part in the Drum-Off Finals, he's excited about what he calls "a total celebration of drums and drummers. The camaraderie and sense of community we share is really something special." Even at this point in his brief career, Jay Weinberg should be anything but nervous, not after the summer he's had, subbing for his father as the drummer for the E Street Band on the Working On A Dream Tour. "Believe me, not a second goes by when I don't think about how fortunate I am," he says. "That I have, you know, a certain family lineage, I don't take that lightly. If anything, it gives me a sense of responsibility and a standard I have to live up to." A devotee of heavy metal, who plays in his own band, The Reveling, while attending Stevens Institute Of Technology in Hoboken, New Jersey, Jay sat down with MusicRadar to discuss "being thrown into the E Street fire on stage" and what it's like to learn 200 songs in only a matter of months. What was it like growing up with a famous father? "It was strange at times. Actually, strange a lot of the time. [laughs] Now that I'm in college in Hoboken, I go to this club called Maxwell's, and that's where the video to Glory Days was shot. Most people watch that video and to them it's a great moment in their lives that they remember. I see it differently. I watch it and I see my parents - my mom is in the video, too - so it's like watching a home movie before I was born. At the same time, it's a video of this iconic song, one that I've played on huge stages in stadiums. The whole thing is incredible, and I don't take for granted how lucky I am." Being that you're still in college, what are your plans? Do you want to be a professional drummer, or are you eyeing another kind of career? "I definitely want to be a professional drummer, and I would've said that before playing with Bruce. This is what I do and I love it. It's my passion. You know, I used to play hockey; I was a goalie. As a goalie, you're that last line of defense, and that's how I see drumming: I'm the last line of defense for the band. I've got their backs and I allow them to shine and get the job done." From what I understand, your father didn't push you to play the drums. "That's right. I started out on the guitar, then the bass, but I didn't really take to them; they didn't feel right to me. Then one day I sat down at one of my father's drum sets and I got hooked immediately. Maybe it was in my blood and I didn't realize it, but the second I started drumming, that was it." Did you dad say, "OK, we're going to start you off right with lessons" - that kind of thing? "He suggested getting me a drum teacher, but I didn't want to mess up what felt very pure. My father knew enough about the drums to let me follow my own path." And yet, he didn't try to teach you himself? That's a little surprising. "I guess so. I think he just didn't want to interfere. You know, that whole 'Let me show you how it's done, son' kind of thing? He knew I would've resisted at the time. I had to do it on my own. He was encouraging and happy that we could share something and talk about it, but as far as teaching me, that never happened." Was he ever 'dorky dad' to you? Even though he's a drummer for one of the biggest bands in the world, did you ever think, as most kids do of their parents, "Oh, God, my dad is so uncool!"? [laughs] "No, never. I have to say, it's always been very cool to have a dad who is super-focused on what he does. Plus, he's always been very involved in what I do, whether it was my schooling or playing hockey - he's always been right there, supporting me. He's my biggest role model. I don't think I would have gravitated towards the drums if it wasn't for him." I understand the two of you have gone to metal shows together. "That's right. In my early teens I got way into Metallica and lots of metal bands. We went to an Ozzfest together and saw Slipknot and Slayer - that whole experience changed my life. Mastodon, too, I'm a big fan and they've become great friends. "My father isn't a snob; he doesn't look at other types of music and go, 'Oh, that's not good' just because it might not be the kind of music he plays. He sees that there's talent and musicianship involved in making metal and all kinds of genres." I'm sure playing in The Tonight Show Band, he's had to embrace so many styles of music. "Yeah. You throw it at him, he can play it. And not just mathematically - he feels it." It's no secret that Max had some very serious hand injuries at one point due to drumming. He was always a very hard hitter. Did he ever talk to you about that and how to protect your hands? "Yes, that he did do. He told me, 'Always warm up before you play, and don't grip your sticks too tight.' Because I used to do that - I started out holding my sticks super-tight - and he got me off of that, thank God. Warming up, too, that's important; it gets the blood flowing. Think about it: Sprinters just can't go out there and run around the track and expect to win a medal. They have to warm up. Same with drumming." Even though you're no sprinter. With the E Street Band, you run marathons. I'm curious: What kind of grip do you have? But is it French or German? [laughs] "Uh, what's the difference?" Well, with the French grip, your fingers are on top of the sticks and your forearms are more rotated outwards. With the German grip, the thumbs are on the side and your forearms are rotated inwards - plus, your palms are facing downwards. "Oh, I see. Hmm, well, in that case I'm more of a French grip player. That's what I do. It always felt natural to me. I never sat down and said, 'OK, I'm going to point my thumbs towards the ceiling.' It just happened that way." OK, let's talk about the Bruce tour you just finished. What was it like when you got the call? How did it come about? "Well, we all knew that my dad wasn't going to be able to do the whole tour. He had to move out to LA to do The Tonight Show, and because they were just getting set up there it just wasn't going to be possible. So Bruce had a conversation with my dad about it and I guess he said I would be able to cut it. "Then one day, the phone rings and it's Bruce: 'Hey there, Jay. This is Bruce. As you know, I have this band [laughs], and in this band we have the world's greatest drummer - only he's got a scheduling conflict. I asked him if he knew of anybody who might be able to fill in and he gave me your name and number.'" Playing Radio Nowhere with Bruce Springsteen in Philadelphia. Max is now "scared to play" the song, says Jay. "He thinks I own it." [laughs] "Yeah, right. But see, that's the thing about Bruce: He likes to keep things in the family if he can; the band and the whole organization is very family-run and it's a very tight group. So he asked me to join right there. It was incredible." Of course, it's one thing to join a band and learn 12 songs, or even a couple of albums. But you had to learn, what, 200 songs? "Pretty much. Bruce gave me a list with about 200 songs on them. It was a lot of homework. Even when we were playing shows, I still had to learn five or six other songs a day. It was a very intense crash course in musical history. A lot of the time we were playing songs I had never even heard before, so I just had to wing it." I've seen a lot of Springsteen shows and I've always noticed that your dad has his eyes on Bruce the whole time. "I did the same thing. For sure. It's Bruce's show, it's his art. You have to be watching him and seeing what he's going to do. And night to night, it can be totally different. The song you played last night might be different from the way you play it the next night. I think any musician on that stage has to be dialed in to Bruce and what he's after. But that's the fun, that's the excitement. I learned what an incredible showman Bruce is." You're probably spoiled in that way, to have played with The Hardest Working Man In Show Business. "I might be. [laughs] It was the ultimate education, no doubt." Like your father, you play on a DW kit. "Yep. A DW kit with Zildjian cymbals." His configuration was alway very minimal. You didn't feel the need to change it? "No. When I was a kid, I used to always love seeing my dad's kit on stage, so I saw no reason why I should change it. It's kind of iconic in that way. I also think the audience knows the way the drums should look, so they don't want to see some massive change to the setup. "Plus, the music doesn't call for it. You don't need a double bass drum setup and tons of rack toms to play Bruce's songs. The music dictates the instrumentation, and my father was always able to make the most out of the basics. This isn't about flailing about and showing how many awesome fills you can do in five seconds; it's about soul. That's something my father was always very attuned to, and I didn't want to mess with that." And I'm sure Bruce would've given you some strange looks, if not a talking-to backstage, if you tried to show off. "Absolutely. But I knew enough going into the gig what the music called for." OK, answer me honestly: Is there any song that your father's played that you feel you play better? Anything that you 'own'? [laughs] "He likes to say Radio Nowhere. He won't even play it anymore. He's scared to play it now. I think he does it just fine, but he thinks I own it." And the flipside: Were there any songs that you just couldn't quite get right, no matter what? "There were a couple I might have been dreading. Let me think…See, there were some hiccups on songs like Johnny 99. Like, I'd come in too late, so then I'd come out too early. It wasn't a train wreck, but drummers might have noticed. But I learned on the job. We did so many songs, these old soul numbers that I never heard in my life." Bruce was doing his Stump The Band routine on the tour. "Yeah! And that got to be real challenging. 'OK, here's a song, you don't know it - go!' And as a drummer, that's what you do. You try to get the vibe; you watch Bruce; you feel the rest of the band; and you say to yourself, 'Oh, please, please, let me do this right!'"